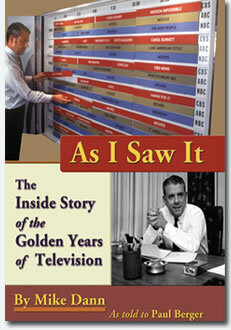 As I Saw It: The Inside Story of the Golden Years of Television is a fast-paced tour through the halls of NBC’s 30 Rock and CBS’s Black Rock in the days when television first staked its claim to be the dominant influence in American cultural life. Along the way, Dann reveals never-before-told stories: Dave Garroway’s anger at being forced to work with a chimpanzee; how a power-crazed CBS network president seduced Judy Garland in his office; and why a fellow CBS executive may have been fed marijuana-laced cookies by a rebellious star. and CBS chairman William S. Paley. For more information about As I Saw It click on Description, Reviews and Excerpts.